This Piece. The piece was fraught with complications. I was completely in love with the patter for the flowers. It came from a book by Vicky Payne (a goddess in the stained glass world), called The Stained Glass Classroom. 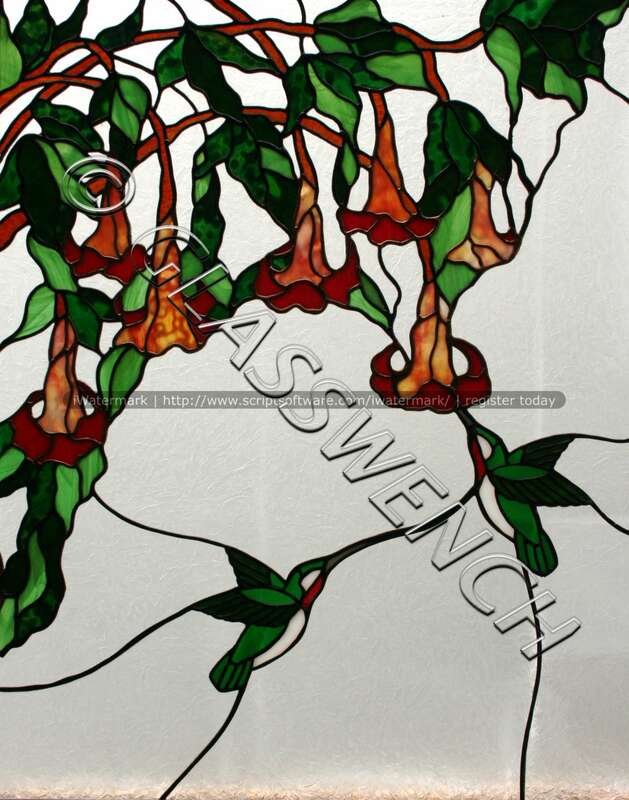 The pattern is called Fuschias Sconce, and is intended for a corner. I decided to enlarge it and add the hummingbirds. I thought the flowers looked more like flowers a freind had in her front yard, called Angel’s Trumpet. I had that gorgeous orange/red/yellow mottled glass and I thought it would be ideal for the flowers. I have a medium sized window in the door to my day job biz, and decided to make the pattern fit that window. I had a ton of fun with this, initially. I chose three different greens for the leaves and a clear glue chip for the pass through areas. Additionally, I decided to go crazy with teh patiina. I patina’d the flowers in the copper, and everything else in black. Once it is all polished up, the black is a deep pewter color which I like more than the black. I finished the piece and took it to work, all excited to put it up. As thigs do when you are working on glass, the size of the piece had grown a bit and it was ahir too large, in one dimension, to fit inside the window. Disappointed, I leaned the piece up against my desk and took my next client. The short story is that the piece was knocked over. It hit the floor and shattered. I still get that drop in my stomach when I recall it. Please let this be a lesson to you, as it has been to me… Keep your glass safe!! Protect it!! All the large pieces of clear glass cracked. Surprisingly, none of the small pieces cracked. Nonetheless, it was going to be a huge nightmare to repair. I was devastated. I couldn’t even look at it for several months. Then, one day, I pulled it out an began the process of repairing it. It now hangs in the door of my business, enjoying the light and the compliments of just about every person who walks through the door.